This article from the Orlando Sentinel really sparked my interest. In the first half of the article, where they talk about the elephant guns, not the section on the ‘matching firepower’ of pistols, does not specifically point out Animal Kingdom, but the animals listed there are, for the most part, obviously Animal Kingdom residents. After reading through the article, I had mixed feelings. Obviously I am glad that they are taking precautions to ensure public safety, and that the weapons would only be used as a last resort. After all, the animals that live and play in the Animal Kingdom are wild animals, no matter how tame and cuddly we think some of them are. Still though, I got a pang in my heart when I thought about one of those creatures being gunned down, especially by one of the people who reviewed the weapon from gunblast.com and was grinning like an idiot, mumbling about getting one of these guns. 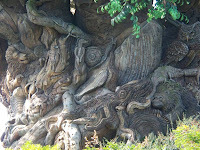 Then I remembered just how much precaution Disney has implemented, as well as state of the art technologies, to ensure that the animals and their guests stay separated, not to mention the creature comforts like air-conditioned rocks. Just think about the Animal Kingdom Lodge for a moment, they have cameras aimed towards the guest balconies, and they are there for more than just your safety. 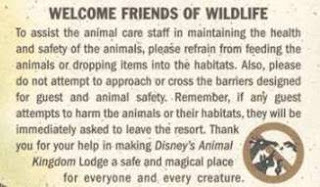 So it looks like those shiny new guns won’t be used around Walt Disney World for a long long time, and that the animals will be remembered from photo-safaris, not as a headline blurb after they take an illegal field trip.